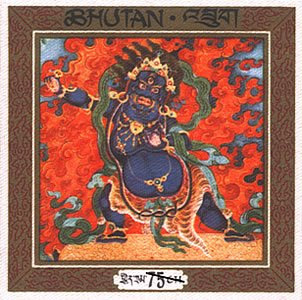 eD@HoMe: A lovely cover from mystical Bhutan! 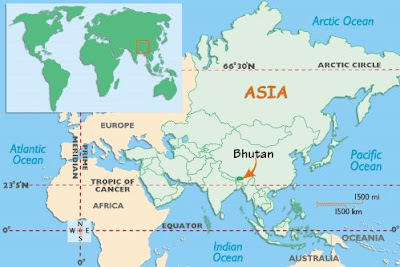 The Kingdom of Bhutan in the Eastern Himalayas has always fascinates the philatelic community with its innovative and exquisite postage stamps. 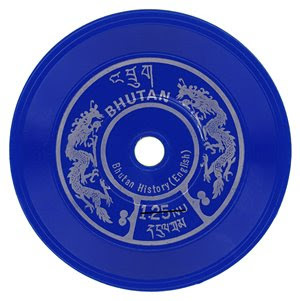 Since 1962, Bhutan has released a series of interesting "world’s firsts" stamps such as the first scented stamps, the first steel stamps, the first silk stamps (made from Bhutanese thangkas), the first 3 Dimensional (3 D) stamps and the first "talking" stamps (tiny vinyl records that played Bhutan’s national anthem and a brief history of the country when spun on a phonograph). 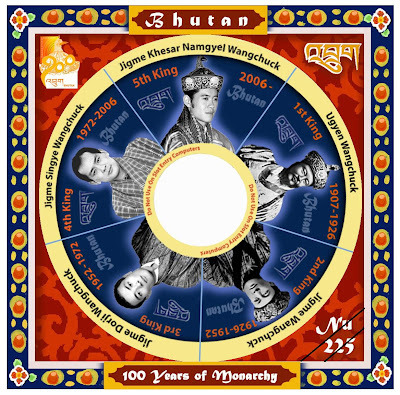 In 2008, Bhutan released a CD-Rom stamp to commemorate the 100th Anniversary of the Monarchy. 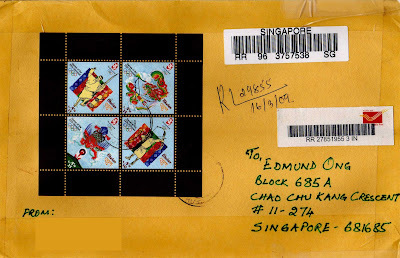 It visually displays historic events of the country and when affixed to a large envelope, the cd stamp can be used as postage. The Bhutan government hopes that this computer-age stamp, which is also the first to feature a documentary about a country, will help educate people in the country and outside it about environmental, cultural and economic sustainability. 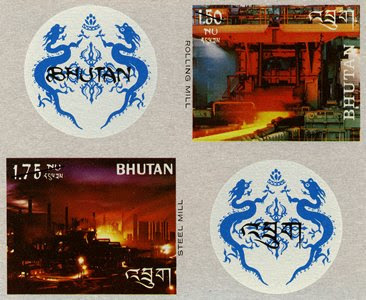 For years, Bhutan stamps have created an important source of revenue for the country, which aided in the development of Bhutan’s first electrical power, hospitals and road systems. In the 1960s, stamps were Bhutan’s biggest source of foreign exchange, pulling in $500,000 a year from foreign philatelists. Today, its stamps earn it about $175,000 a year in revenue. 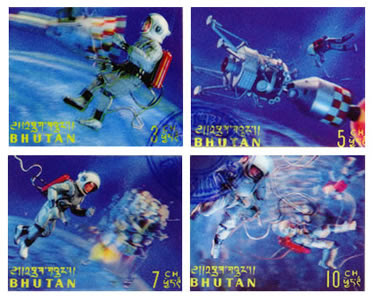 The stamps have also created an international awareness of Bhutan and helped to boost its tourism. 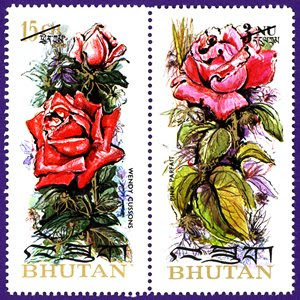 In Bhutan, stamps aren’t just a payment for a mail service, they are a work of art! For today, I would like to share with you my first cover from this mystical country. On this registered cover is a souvenir sheet that belongs to the Bhutan XXIX Olympic series (Beijing Summer Olympic Games), issued on 2nd May 2008. 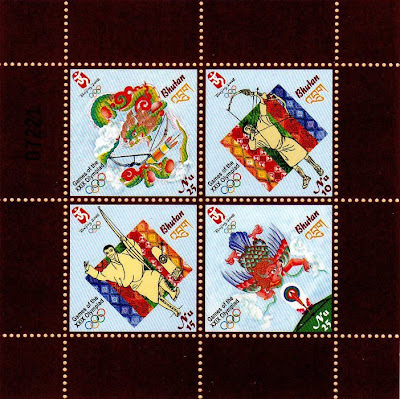 The stamps depict Bhutan’s national sport, Dha (Archery). 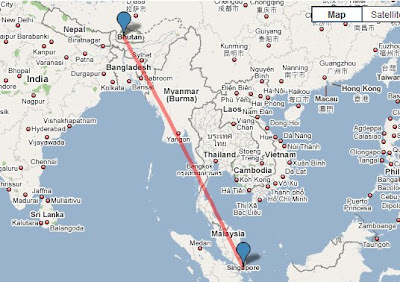 This cover traveled an estimated distance of 3,268 km and took 8 days to reach me. With such beautiful stamps, it's no wonder Bhutan was rated as the happiest country in Asia and the eighth happiest country in the "World Map of Happiness" survey conducted in 2006!